I think this has been the best day yet. So many amazing things happened today. I can't believe so much can happen in such a short amount of time! For this reason, I'm going to split up Day 3 into two different posts. This is the first one. For the second half with our Animator's Palate Dinner Review, princess visits and evening entertainment- click here. We started out a bit unconventionally. We had the great pleasure of holding church on the cruise boat in one of the lounges with my family. There were probably about 40 of us there. Now, in my Christian religion, you need to know the music is very traditional. Pretty much all hymns. So when my uncle was trying to start the meeting and the DJ kept putting on music, it didn't quite set the mood. My uncle kept asking him to turn it off, but the DJ just kept trying different songs. We were all cracking up!! The DJ was pretty sure he knew what we needed, but wasn't quite understanding. Ha ha ha! Finally the DJ gave up and we got the meeting started. 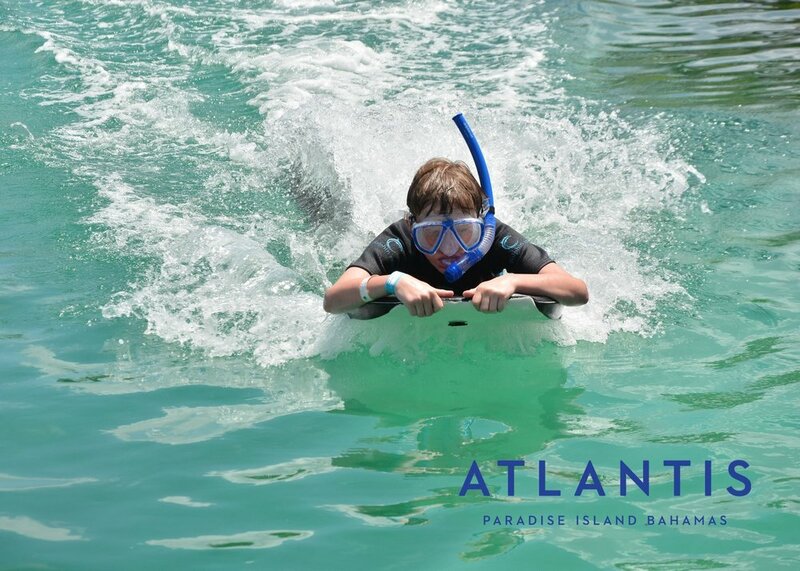 After our quick church service, we changed our clothes quickly and exited the boat to hit our excursion: The Atlantis Resort Waterpark and Dolphin Encounters on Nassau Island in the Bahamas. The waterpark was incredible. One of my husband's dreams has been to ride the Leap of Faith waterslide that takes you on a slide straight down into a shark tank. It really looks intimidating. He and my big kids ran to do that first. In the mean time, my aunt and I claimed a bunch of lounge chairs near the kiddie area as our home base for the day. It ended up being a really central location. It was a great place to meet up. We also ran over to rent a small locker ($16- not cheap!) We just used it for our valuables- money and passports etc. They only accepted credit cards, and I was glad we had one on hand since Disney recommended that you only use cash on Nassau for safety reasons. So I hadn't even brought mine off the boat. The nice thing about the locker was that you could get in and out of it during the day. It wasn't a one time lock up and open. We ended up using one locker for several of the families that were traveling with us. *Just a side note on the lockers: When we were done with the waterpark area, we grabbed our stuff out of the locker and brought it with us to the dolphin area. Super glad we did, because they have lockers for you there as part of the experience in the dolphin area, and we ended up leaving from there. It would've been a pretty long walk back to the lockers just for our valuables. Plus we needed our money, etc. for purchases in the dolphin area. Once we got everything settled with our belongings, we headed over to the River Rapids Ride. I thought this was just going to be your typical lazy river. Not at all!! It was so awesome. The current was swifter than your normal lazy river and every so often a huge wave would come up behind you to push you even further down. There were a few rapids, and there were some lazy parts as well. They don't allow babies under 2 on the ride, so that was a bit of a bummer for us. My mom was so sweet to take Baby J for us to the kiddie area most of the day so we could play with our big kids. One of the coolest things about the River Rapids Ride(and we didn't figure this out until the end of the day!! Ugh!!) was that there were all these waterslides that you could ride that funneled unto the river. It was so neat!! 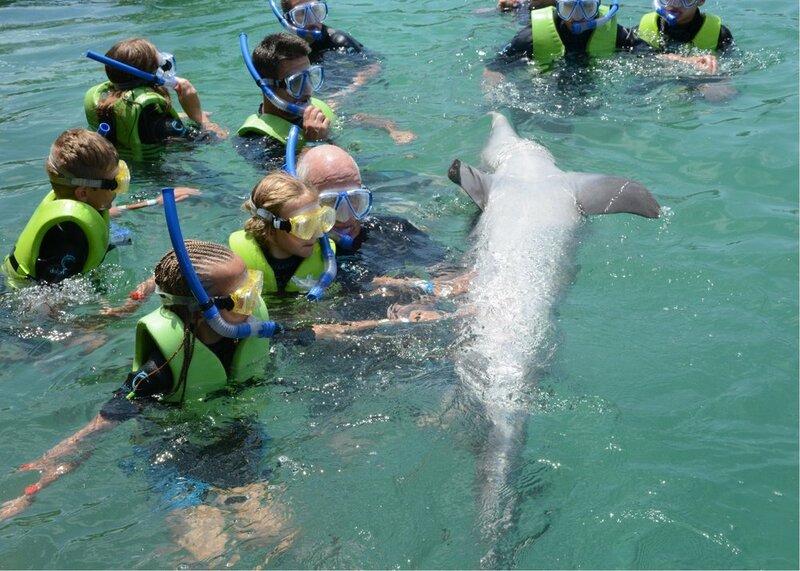 We only got to ride one of them because we had to get to our dolphin excursion, but it was so fun!! I'm glad we did that. Another one of our favorite slides was the Serpent Slide. It is also located in the Mayan Temple with the Leap of Faith. Unlike the Leap of Faith, it's a tube slide and goes just slow enough that you can see the shark tank really well as you go through the bottom. The one complaint every one had about the Leap of Faith was it looked really awesome, but the water splashed in your face so much you couldn't even see the sharks. We got a lunch voucher with our excursion and were pleasantly surprised by the selection. It wasn't fancy, but it was definitely a step above your typical waterpark food, and the portions were huge. 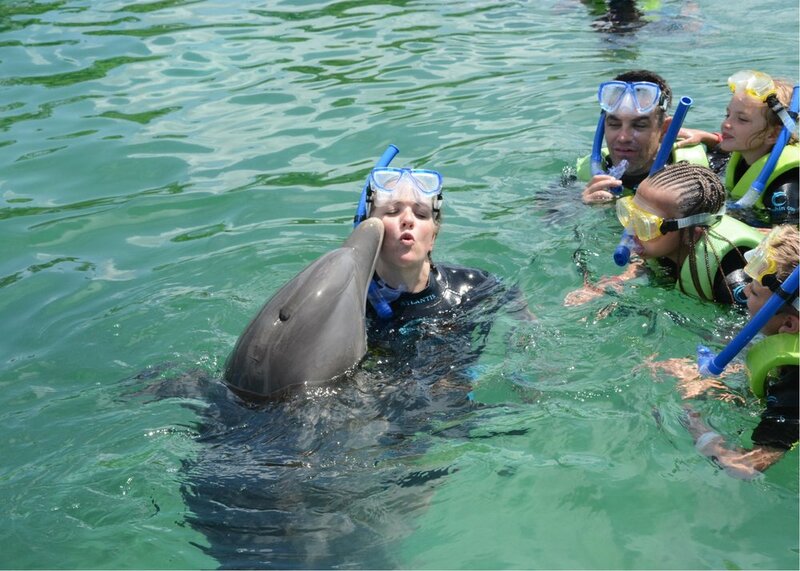 After about 4 hours of the waterpark, it was time for our dolphin excursion. We could've spent another full day at the waterpark and not seen everything. It really was neat. But I feel like we definitely hit the best parts. 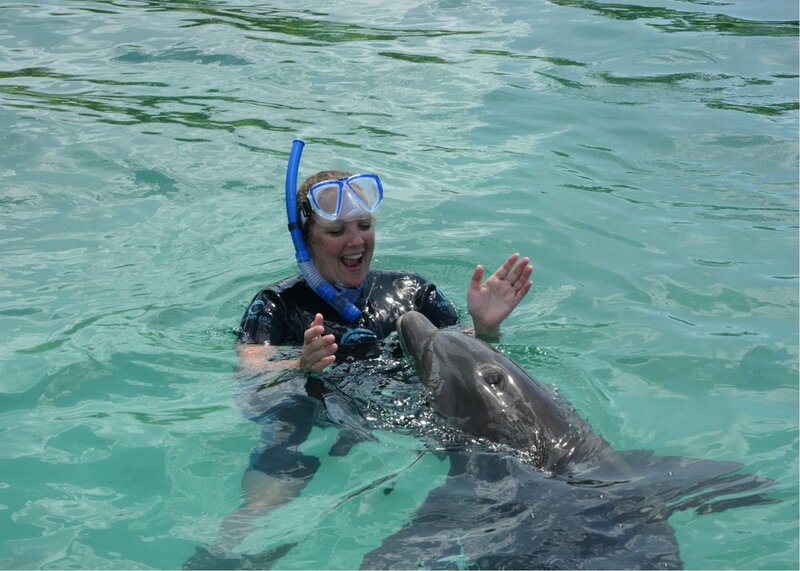 The dolphin experience- so amazing!!!!!!! My mom took my two youngest with her on the Shallow Water Excursion, along with a bunch of my cousins and tiny kids. Ages 3 and under are free, so we just had to pay for my mom. That was really nice. 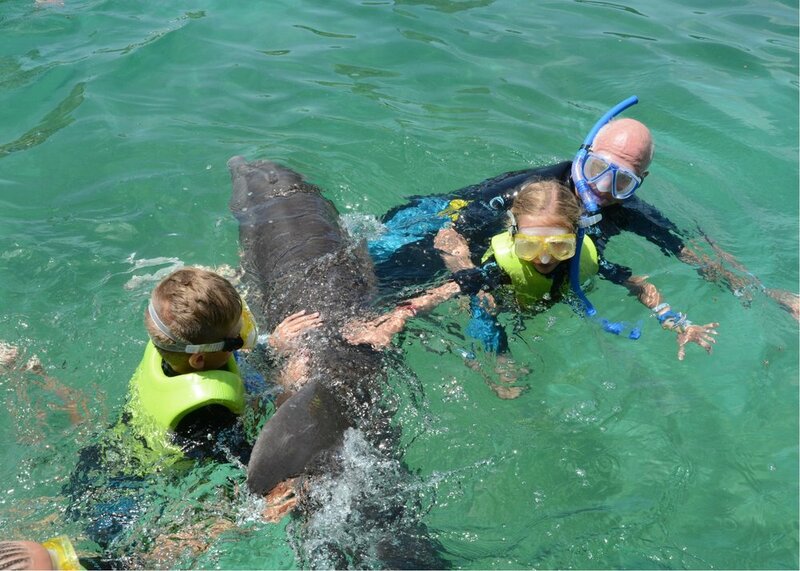 They got to spend about an hour with the dolphins and it was so neat. They fed them, pet them, and played with them. One of the things I really loved, was that I could see them in the shallow area from where I was in the Deep Water Excursion. I wasn't close, but I could see the different things they were doing and how my tiny ones were interacting with the dolphins. It was awesome. The rest of us were at the Deep Water Excursion (my 7 year old on up). Our experience was about 15 minutes longer than the Shallow. Everyone has to put on wet suits, and we put all our belongings in the lockers they provided. The lockers are the digital kind where you put in your own pass code. They had snorkel masks, which I didn't feel like I needed during the excursion, but it was a fun thing to take home (included in your excursion). Some of my family members were using them to see the dolphins under the water. They also had life jackets if you wanted them. Most of our group used those. I love to swim, so I didn't use one. I was amazed at how buoyant I was with the wet suit on. I didn't have to do much to keep myself afloat. We played fetch with the dolphins, danced with them, gave kisses, pet them a ton, and my favorite was when they pushed our feet while we zoomed around on the kick boards. They are powerful, beautiful, playful, incredible animals. It was such an experience of a lifetime. We all loved it. After a long process, we got our photos purchased and headed to grab a taxi bus back to the boat. If you go with a group, the best thing is to have someone purchase the digital photo package, and select the photos that everyone is in. Then you can pitch in for the cost and email out the website login info and everyone can grab the photos they want. To do that was $170, but the other options ended up being even more expensive if you wanted multiple pictures. We made it back to the boat and cleaned up and headed over to visit with some Disney characters for a few minutes before dinner. 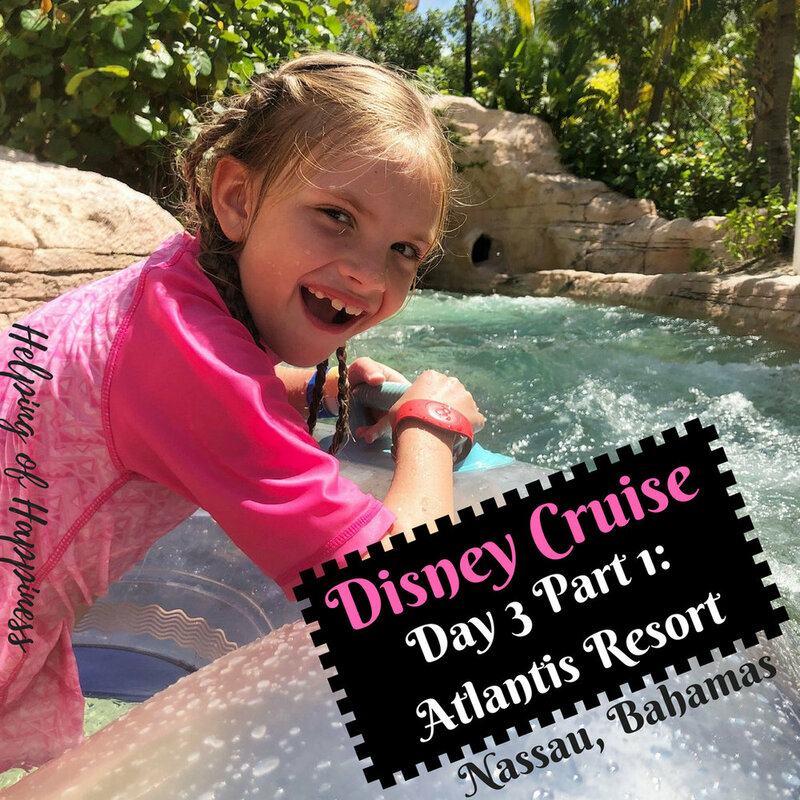 Check out the other adventures we had on our Disney Cruise!